Nickeline: Mineral information, data and localities. Originally named kupfernickel in 1694 by Urban Hjärne from the German nickname for Satan or Nick (in the sense of a mischievous deceiver), because the ore seemed to contain copper but yielded none. Renamed nickeline in 1832 by François Sulpice Beudant in allusion to its nickel contents. 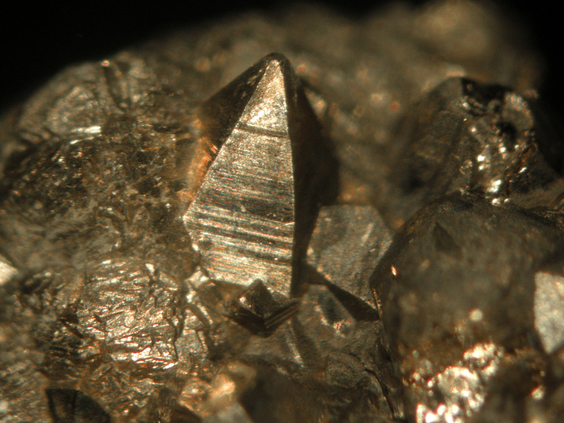 Also renamed niccolite by James Dwight Dana in 1868 from the Latin "niccolum". The most common member of the nickeline group. 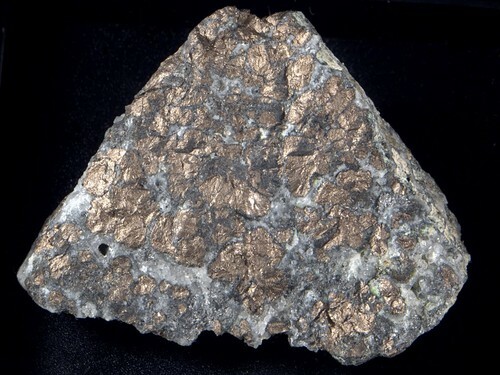 An important nickel ore mineral. Whitish yellow-pink to light brownish pink. Rammelsbergite 36 photos of Nickeline associated with Rammelsbergite on mindat.org. Silver 30 photos of Nickeline associated with Silver on mindat.org. Annabergite 29 photos of Nickeline associated with Annabergite on mindat.org. Gersdorffite 24 photos of Nickeline associated with Gersdorffite on mindat.org. Skutterudite 23 photos of Nickeline associated with Skutterudite on mindat.org. Breithauptite 20 photos of Nickeline associated with Breithauptite on mindat.org. Calcite 20 photos of Nickeline associated with Calcite on mindat.org. Safflorite 16 photos of Nickeline associated with Safflorite on mindat.org. Dolomite 16 photos of Nickeline associated with Dolomite on mindat.org. Bismuth 14 photos of Nickeline associated with Bismuth on mindat.org. Russell, A. (1927) Notice of an occurrence of niccolite and ullmannite at the Settlingstones mine, Fourstones, Northumberland; and of serpierite at Ross Island mine, Killarney, Co. Kerry, Ireland. Mineralogical Magazine, vol. 21, n° 119, 383-387. Zeitschrift für Kristallographie (1933) 84: 408. Palache, C., Berman, H., and Frondel, C. (1944) The System of Mineralogy of James Dwight Dana and Edward Salisbury Dana Yale University 1837-1892, Volume I: Elements, Sulfides, Sulfosalts, Oxides. John Wiley and Sons, Inc., New York. 7th edition, revised and enlarged, 834pp. : 236-238. The following Nickeline specimens are currently listed for sale on minfind.com. Milka K. de Brodtkorb (1973) 5th Congreso Geologico Argentino 1:63-68, Cordoba. ; C. S. Lurgo Mayón (1999). Depósitos polimetálicos ricos en Níquel, Cobalto y Arsénico de la cordillera oriental, Jujuy y Salta. Stanton, R.L. (1953) The Lloyd copper mine, Burraga. In: Edwards, A.B. (ed. ), Geology of Australian Ore Deposits, pp.906-909. Australasian Institute of Mining and Mettalurgy, Melbourne. ⓘ North Mine (North Broken Hill Mine; NBH Mine) ? McNeill, A.R. (1973) Mount Bonnie Prospect, Progress Report No.1. Horizon Explorations Limited, Report No. 63. Northern Territory Geological Survey. A. Strasser: Die Minerale Salzburgs (1989); Kolitsch, U. & Brandstätter, F. (2008); Buttinger-Kreuzhuber, T. (2014): Optische und chemische Analyse einer Nickelerzparagenese der Zinkwand in den Schladminger Tauern. Bachelor-Arbeit, Universität Wien, 30 S.
ⓘ Alte Zeche Mine ? Coppola, V., Boni, M., Gilg, H.A., Balassone, G., and Dejonghe, L. (2008): Ore Geology Reviews 33, 187-210. Machlan, L. A., & Barnes, I. L. (1989). The absolute isotopic composition and atomic weight of terrestrial nickel. News Briefs, 94(6), 357. Econ Geol (1994) 89:1630-1639; Y. Chen, M. E. Fleet and Y. Pan (1993) Platinum-group minerals and gold in Arsenic-rich ore at the Thompson mine, Thompson Nickel Belt, Manitoba, Canada. Mineralogy and Petrology 49:127-146; Chen, Yuan, "Precious-metal Mineralization And Sulfide-silicate Relationships In Some Canadian Nickel-copper Sulfide Deposits: Thompson Mine, Manitoba; Sudbury, Ontario; Dundonald Beach, Ontario" (1993). Digitized Theses. Paper 2231. Hill, Patrick A. and Ruest, Arthur E., 1981, Heavy Minerals and Metals in Port au Port Bay, Newfoundland, A Reconnaissance, Economic Geology, v. 76, p. 961-970. Bennett G. (1978) Geology of the Northeast Temagami Area, Ontario Geological Survey, Report 163, p.85. ⓘ Silver Harbour Mine (Beck Mine; Three A Mine; 3 A) ? Ann P.Sabina (1991), Rocks and Minerals for the Collector, Sudbury to Winnipeg. GSC Misc. Report 49. Sergiades, A.O., Silver Cobalt Calcite Vein Deposits of Ontario, 1968; Satterly, J. (1977) A Catalogue of the Ontario Localities Represented by the Mineral Collection of the Royal Ontario Museum; Ontario Geological Survey Miscellaneous Paper MP70,464p. Pring, A., Grguric, B.A., Criddle, A.J. (1998) Lindstromite from Cobalt, Ontario. The Canadian Mineralogist, 36, 1139-1148.
ontariominerals.com; Satterly, J. 1977: A Catalogue of the Ontario Localities Represented by the Mineral Collection of the Royal Ontario Museum; Ontario Geological Survey Miscellaneous Paper MP70,464p. Knight, Cyril W. (1922). Geology of The Mine Workings of Cobalt and South Lorraine Areas; Thirty - First Annual Report of the Ontario Department of Mines, Vol. 21, Pt.2, P. 118, 120. Knight, Cyril W. (1922). Geology of The Mine Workings of Cobalt and South Lorraine Areas; Thirty - First Annual Report of the Ontario Department of Mines, Vol. 21, Pt.2, P. 50. Knight, Cyril W. (1922). Geology of The Mine Workings of Cobalt and South Lorraine Areas; Thirty - First Annual Report of the Ontario Department of Mines, Vol. 21, Pt.2, P. 51, 53. Can Mineral December 1971 v. 11 no. 1 p. 108-139; Satterly, J. (1977) A Catalogue of the Ontario Localities Represented by the Mineral Collection of the Royal Ontario Museum; Ontario Geological Survey Miscellaneous Paper MP70,464p. Dana 7:I:193-194.; Mineralogical Magazine 1940 25 : 557-572.; Satterly, J. (1977) A Catalogue of the Ontario Localities Represented by the Mineral Collection of the Royal Ontario Museum; Ontario Geological Survey Miscellaneous Paper MP70,464p. HORVÁTH, L. & PFENNINGER-HORVÁTH, E. (2000) I minerali di Mont-Saint-Hilaire (Québec, Canada) Rivista Mineralogica Italiana, XXIV, 140-202 (in Italian with English summary). David Quirt (2006) Uranium 101: Geochemistry and Uranium Deposit Metallogenesis. in Uranium Exploration in Western Canada Short Course Notes MEG ed. D. Pana; Maurice, Y.T., G.J. Strnad, and w. Dyck (1983) Interpretation of Secondary Dispersion Patterns at Key Lake, Northern Saskatchewan. Journal of Geochemical Exploration, 19(1-3), 643-661. Barkov, A.Y., Laflamme, J.H.G., Cabri, L.J., and Martin, R.F. (2002) Platinum-group minerals from the Wellgreen Cu-Ni-PGE deposit, Yukon, Canada. Canadian Mineralogist: 40: 651-669. Dahlkamp, F.J., Ed. (2009): Uranium Deposits of the World. Springer (Berlin, Heidelberg), pp. 31-156. Min, M. (1995): Ore Geology Reviews 10, 51-64. Min, M., Zheng, D., Shen, B., Wen, G., Wang, X., and Gandhi, S.S. (1997): Mineralium Deposita 32(5), 505-519. Dr Gunther Grundmann collection and ID, via H. Rosinsky (Berlin) (whose label said "Wismut & Rotnickelkies"), mined in 1892. Billay, A.Y., Kisters, A.F.M., Meyer, F.M., and Schneider, J. (1997): Mineralium Deposita 32, 491-504. Molnár, F., Oduro, H., Cook, N. D., Pohjolainen, E., Takács, Á., O’Brien, H., ... & Wirth, R. (2016). Association of gold with uraninite and pyrobitumen in the metavolcanic rock hosted hydrothermal Au-U mineralisation at Rompas, Peräpohja Schist Belt, northern Finland. Mineralium Deposita, 51(5), 681-702. Hänninen, Esko (1978). Enonkosken Laukunkankaan Ni-Cu-esiintymän malmimineralogiasta. Outokumpu OY:n malminetsintä raportit. Dietrichs, J. (2006): Die Mineralien der Nickelgrube "Großfürstin Alexandra" im Ostharz. Lapis 31 (6), 28-30; 70. Verein Mansfelder Berg- und Hüttenleute e.V. und Bergbaumuseum Bochum (Hrsg. ): Mansfeld - Die Geschichte des Berg- und Hüttenwesens. Lutherstadt Eisleben und Bochum 1999, ISBN 3-921-533-69-4. Nickerl, F., and Röthig, H. (2000): Verzeichnis der Berggebäude von Annaberg 1500-1900. Streifzüge durch die Geschichte des oberen Erzgebirges, Bergbaunachrichten. Arbeitskreis Annaberg-Buchholzer Heimatforscher, 60 pp. Economic Geology 102 (2007) 1269-1294.; Bonev, I. K., Petrunov, R., Cook, N. J., & Ciobanu, C. L. (2005). Kostovite and its argentian varieties: Deposits and mineral associations. Geochem. Mineral. Petrol.(Bulg. Acad. Sci. ), 42, 1-22. Yassin, S.Z., Goff, J.C. (Eds.) (2006): Geology of Iraq. Dolin, Prague and Moravian Museum, Brno, 337 pp. Bombicci, L. (1877) Contribuzioni di mineralogia italiana. Parte III. Millerite di Nieddoris ecc. (Sardegna). Memorie della R. Accademia delle Scienze dell'Istituto di Bologna, serie 3a, 8, 343-344; AA. VV., 1996. Collezionare minerali. Hobby & Work. Jervis, G. (1881) I tesori sotterranei dell'Italia. Vol. 3: Regioni delle Isole. Sardegna e Sicilia. Addenda ai precedenti volumi. Ermanno Loescher, Torino, XXII+539 pp. ; Billows, E. (1941) I minerali della Sardegna e i loro giacimenti. Tipografia V. Musanti, Cagliari, 167 pp. ; Stara, P., Rizzo, R., and Tanca, G.A. [with contributions of Vinci, A., and Astolfi, M.] (1996) Iglesiente e Arburese. Miniere e Minerali. Associazione Mineralogica Sarda, Associazione Mineralogica Domusnovas, Gruppo Mineralogico Arburese, Gruppo Mineralogico Paleontologico Piacentino, Gruppo Mineralogico Lombardo et al. Ed., Siena, Vol. 2, 192 pp. Dessau, G. (1936) I minerali dei filoni a nichelio e cobalto dell’ Arburese (Sardegna). Periodico di Mineralogia, 7 ,21–39; Billows, E. (1941) I minerali della Sardegna e i loro giacimenti. Tipografia V. Musanti, Cagliari, 167 pp. ; Stara, P., Rizzo, R., and Tanca, G.A. [with contributions of Vinci, A., and Astolfi, M.] (1996) Iglesiente e Arburese. Miniere e Minerali. Associazione Mineralogica Sarda, Associazione Mineralogica Domusnovas, Gruppo Mineralogico Arburese, Gruppo Mineralogico Paleontologico Piacentino, Gruppo Mineralogico Lombardo et al. Ed., Siena, Vol. 2, 192 pp. Billows, E. (1941) I minerali della Sardegna e i loro giacimenti. Tipografia V. Musanti, Cagliari, 167 pp. ; Stara, P., Rizzo, R., Tanca, G.A. (1996): Iglesiente e Arburese. Miniere e Minerali. Edito a cura dell'EMSA e "varie associazioni mineralogiche", Volume 2°, 192 pp. Piepoli, P. (1933) Étude microscopique de quelques minerais des filons argentifères du Sarrabus (Sardaigne). Bulletin de la Société française de minéralogie, 56, 6-7-8, 277-302; Stara, P., Rizzo, R., Brizzi, G. (1993) Sarrabus. Miniere e Minerali. Associazione Mineralogica Sarda, Gruppo Mineralogico Lombardo, Associazione Piemontese Mineralogia Paleontologia e Mostra Torinese Minerali, Centro Mineralogico Varesino, Amici Mineralogisti Fiorentini, Gruppo Mineralogico Paleontologico Piacentino, et al., Stige Milano Srl, Milano, 208 pp. Bombicci, L. (1877) Contribuzioni di mineralogia italiana. Parte III. Minerali delle Miniere del Sarrabus, esercitate dalla Società anonima di Lanusei in Sardegna. Memorie della R. Accademia delle Scienze dell'Istituto di Bologna, serie 3a, 8, 326-344; Traverso, G.B (1881) Giacimenti a minerali d'argento del Sarrabus e di alcune specie di minerali provenienti dai filoni che lo costituiscono, facenti parte della collezione mineralogica del Museo Civico di Genova. Annali del Museo Civico di Storia Naturale di Genova, 16, 493-522; De Castro, C. (1890) Descrizione geologico-mineraria della zona argentifera del Sarrabus (Sardegna). Memorie descrittive della Carta geologica d'Italia, 5, 68 pp. + 6 plates + 1 folded geological map; Traverso, G.B. (1898) Sarrabus e suoi minerali. Note descrittive sui minerali del Sarrabus facenti parte della collezione di minerali italiani presso il Museo civico di Genova. Tipografia e Libreria Sansoldi, Alba, 73 pp. ; Piepoli, P. (1933) Étude microscopique de quelques minerais des filons argentifères du Sarrabus (Sardaigne). Bulletin de la Société française de minéralogie, 56, 6-7-8, 277-302; Stara, P., Rizzo, R., Brizzi, G. (1993) Sarrabus. Miniere e Minerali. Associazione Mineralogica Sarda, Gruppo Mineralogico Lombardo, Associazione Piemontese Mineralogia Paleontologia e Mostra Torinese Minerali, Centro Mineralogico Varesino, Amici Mineralogisti Fiorentini, Gruppo Mineralogico Paleontologico Piacentino, et al., Stige Milano Srl, Milano, 208 pp. De Castro, C. (1890) Descrizione geologico-mineraria della zona argentifera del Sarrabus (Sardegna). Memorie descrittive della Carta geologica d'Italia, 5, 68 pp. + 6 plates + 1 folded geological map; Piepoli, P. (1933) Étude microscopique de quelques minerais des filons argentifères du Sarrabus (Sardaigne). Bulletin de la Société française de minéralogie, 56, 6-7-8, 277-302; Stara, P., Rizzo, R., Brizzi, G. (1993) Sarrabus. Miniere e Minerali. Associazione Mineralogica Sarda, Gruppo Mineralogico Lombardo, Associazione Piemontese Mineralogia Paleontologia e Mostra Torinese Minerali, Centro Mineralogico Varesino, Amici Mineralogisti Fiorentini, Gruppo Mineralogico Paleontologico Piacentino, et al., Stige Milano Srl, Milano, 208 pp. ; Manca, A., Manca, R., Manca, L. (1995) La miniera di Masaloni (Sarrabus, Sardegna). Rivista Mineralogica Italiana, 18, 3 (3-1995), 291-297. Traverso, G.B (1881) Giacimenti a minerali d'argento del Sarrabus e di alcune specie di minerali provenienti dai filoni che lo costituiscono, facenti parte della collezione mineralogica del Museo Civico di Genova. Annali del Museo Civico di Storia Naturale di Genova, 16, 493-522; De Castro, C. (1890) Descrizione geologico-mineraria della zona argentifera del Sarrabus (Sardegna). Memorie descrittive della Carta geologica d'Italia, 5, 68 pp. + 6 plates + 1 folded geological map; Piepoli, P. (1933) Étude microscopique de quelques minerais des filons argentifères du Sarrabus (Sardaigne). Bulletin de la Société française de minéralogie, 56, 6-7-8, 277-302; Stara, P., Rizzo, R., Brizzi, G. (1993) Sarrabus. Miniere e Minerali. Associazione Mineralogica Sarda, Gruppo Mineralogico Lombardo, Associazione Piemontese Mineralogia Paleontologia e Mostra Torinese Minerali, Centro Mineralogico Varesino, Amici Mineralogisti Fiorentini, Gruppo Mineralogico Paleontologico Piacentino, et al., Stige Milano Srl, Milano, 208 pp. Kjerulf and Dahll (1861b, p. 329); Neumann (1985, p. 28). Hoehne K. 1936: Über einige Arsen-, Nickel-, Kobalt-, Silber-, Wismut- und Uranerzführende Kalkspatgänge dre Grube Bergfreiheit zu Oberschmiedeberg im Riesengebirge. Chem d. Erde Bd 10; Econ Geol (1997) 92:468-484; Mochnacka, K., Oberc-Dziedzic, T., Mayer, W., & Pieczka, A. (2015). Ore mineralization related to geological evolution of the Karkonosze–Izera Massif (the Sudetes, Poland)—Towards a model. Ore Geology Reviews, 64, 215-238. Dan Weinrich; Ilinca, G. (1998) Ph.D. Thesis, University of Bucharest, Romania, 356 p. (in Romanian). ; Ilinca, G. (2012) Upper Cretaceous contact metamorphism and related mineralization in Romania. Acta Mineralogica-Petrographica, Abstract Series, Szeged, Vol. 7. Ilinca, G. (1998) Ph.D. Thesis, University of Bucharest, Romania, 356 p. (in Romanian). ; Ilinca, G. (2012) Upper Cretaceous contact metamorphism and related mineralization in Romania. Acta Mineralogica-Petrographica, Abstract Series, Szeged, Vol. 7. Pavel M. Kartashov data; Pekov, I.V., Levitskiy, V.V., Krivovichev, S.V., Zolotarev, A.A., Bryzgalov, I.A., Zadov, A.E. & Chukanov, N.V. (2012): New nickel-uranium-arsenic mineral species from the oxidation zone of the Belorechenskoye deposit, Northern Caucasus, Russia: I. Rauchite, Ni(UO2)2(AsO4)2.10H2O, a member of the autunite group. European Journal of Mineralogy, 24, 913-922. Števko M., Sejkora J., Litochleb J., Macek I., Bačík P., 2013: Krutovit a sprievodné minerály z lokality Dobšiná-Teliatko (Slovenská republika). Bull. mineral.-petrolog. Odd. Nár. Muz. (Praha), 21, 1, 1-14 (in Slovak with English abstract). Henning, A., van der Westhuizen, W.A., de Bruiyn, H., and Beukes, G.J. (1997): Mineralium Deposita 32, 410-418. Tolman, C. F., & Rogers, A. F. (1916). A Study of the Magmatic Sulphide Ores. Leland Stanford Junior Univ. Pub., Univ. Service. Canadian Mineralogist 38:567-584 (2000); CHOI, S. G., & IMAI, N. (1985). Ni-Fe-Co Arsenides and Sulpharsenides from the Ulsan Mine, Republic of Korea. Mining Geology, 35(189), 1-16. Calvo, M. (2008) Minerales de Aragón. Prames. 463 pages; Fanlo, I., Subías, I., Gervilla, F. and Manuel, J. (2006). Textures and compositional variability in gersdorffite from the Crescencia Ni-(Co-U) showing, Central Pyrenees, Spain: Primary deposition or re-equilibration?. Canadian Mineralogist: 44: 1513-1528. Moralev, G.V., and Shatagin, K.N. (1999): Mineralium Deposita 34, 405-413. Gregor, W. (1818): Transactions of the Royal Geological Society of Cornwall 1, 224-225; Phillips, W. (1823): An Elementary Introduction to the Knowledge of Mineralogy, 3rd ed. William Phillips (London), 535 pp. ; Hogg, T. (1825): A Manual of Mineralogy. Polyblank Publishers (London), pp. 50-51; Hall, T.M. (1868): The Mineralogist's Directory. Edward Stanford (London), 168 pp. Phillips, W. (1823): An Elementary Introduction to the Knowledge of Mineralogy, 3rd ed. William Phillips (London), 535 pp. ; Hall, T.M. (1868): The Mineralogist's Directory. Edward Stanford (London), 168 pp. ; Collins, J.H. (1871): A Handbook to the Mineralogy of Cornwall and Devon. D. Bradford Barton Ltd. (Truro, UK), 108 pp. Dines, H.G. (1956): The metalliferous mining region of south-west England. HMSO Publications (London), Vol. 2, pp. 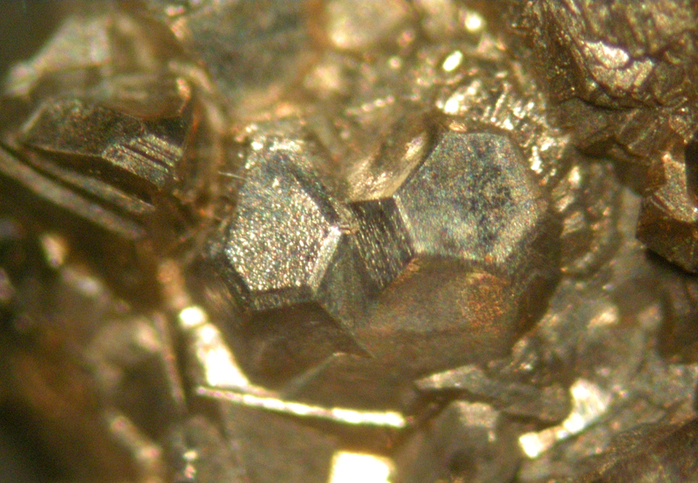 545-546; Merry, M. & Weiß, S. (2017): Nickel- und Kobaltmineralien aus der St. Austell Consols Mine, Cornwall (GB). Lapis, 42 (1), 24-26; 39-40; 62 (in German). Dunham, Sir K. C. Geology of the North Pennine Orefield, Volume 1 Tyne to Stainmore (2nd Edition), pp 11. Fisher, J. (2009) The Hilton Mine: Scordale, Cumbria England. Rocks and Minerals, 84:2, 114-121. Dana 7: I: 302.; Russell, A. (1927) Notice of an occurrence of niccolite and ullmannite at the Settlingstones mine, Fourstones, Northumberland; and of serpierite at Ross Island mine, Killarney, Co. Kerry, Ireland. Mineralogical Magazine, vol. 21, n° 119, 383-387.; Ixer, R.A. and Duller, P.R. (1998) Virtual atlas of opaque and ore minerals in their associations. ; Young, B. (2011) Millerite from Coldberry Gutter and Great Eggleshope, Teesdale, County Durham. NHSN-Transactions, vol. 71, part 2, 111-114. Temple, A.K. (1954) Rammelsbergite from the Southern Uplands of Scotland. Mineralogical Magazine, vol. 30, n° 227, p. 541-543.; Livingstone, A. and Macpherson, H.G. (1983) Fifth supplementary list of British minerals (Scottish). Mineralogical Magazine, vol. 47, n° 342, p. 99-105.; Livingstone, A. (2002) The Minerals of Scotland - past and present, NMS Publications Ltd.
Livingstone, A. (2002) : Minerals of Scotland - past and present, NMS Publications Ltd.
Mineralogical Magazine 1954 30 : 541-543. Anthony, J.W., et al (1995), Mineralogy of Arizona, 3rd.ed. : 313; Wenrich, K.J. & H.B. Sutphin (1988), Recognition of breccia pipes in northern Arizona, AZ Bur. Geol. Min. Tech. Fieldnotes: 18: 1-5, II. Anthony, J.W., et al (1995), Mineralogy of Arizona, 3rd.ed. : 335, 390, 393; Bastin, E.S. (1922), Primary native-silver ores near Wickenburg, AZ, and their bearing on the genesis of the silver ores of Cobalt, Ontario, USGS Bull. 735: 131-155; Galbraith, F.W. (1947), Minerals of AZ, AZ Bur. Mines Bull. 153: 9, 15, 20, 27, 28. Küstel, Guido (1865): Tellurite of gold and silver: Mining and Scientific Press: 10: 306; Murdoch, Joseph & Robert W. Webb (1966), Minerals of California, Centennial Volume (1866-1966): California Division Mines & Geology Bulletin 189: 279. Bowen, O.E., Jr. & C.H. Gray, Jr. (1957), Mines and mineral deposits of Mariposa County, California: California Journal of Mines and Geology: 53(1&2): 154; Pemberton, H. Earl (1983), Minerals of California; Van Nostrand Reinholt Press: 66. Cooney, R.L. (1956), The mineralogy of the Jensen and Henshaw quarries near Riverside, California: Unpublished Master’s thesis, University of California at Los Angeles: 30; Pemberton, H. Earl (1983), Minerals of California; Van Nostrand Reinholt Press: 65, 66. USGS (2005), Mineral Resources Data System (MRDS): U.S. Geological Survey, Reston, Virginia, loc. file ID #10261998. Chomiak, B. A. (1989): An integrated study of the structure and mineralization at Great Hill, Cobalt, Connecticut [M.S. thesis]: University of Connecticut, Storrs, Connecticut, 288 p.
King, V. and Foord, 1994, Mineralogy of Maine, volume 1. Rainville, G. D. and Park, W. C. (1976) Nickeliferous Pyrrhotite Deposits, Knox County, Southeastern Maine in Lyons, P. C. and Brownlow, A. H. (editors) Studies in New England Geology, Memoir 146, Geological Society of America, p. 319-347.; King & Foord, 1994. Mineralogy of Maine, V.1. ⓘ Seneca No. 1 Shaft ? ⓘ Willow Springs prospect (Willow Spring) ? Palache(1935):29; Oen, et al: Neues Jahrbuch für Min. Abhandlungen:150:259-272; Dunn(1995):Pt4:547-549. Robert C. Smith, II Ph.D.
ⓘ Josephine Creek placers ? ⓘ Oxford Serpentine Quarry (Collins prospect) ?